Almost half of our DNA sequences are made up of jumping genes—also known as transposons. They jump around the genome in developing sperm and egg cells and are important to evolution. But their mobilization can also cause new mutations that lead to diseases, such as hemophilia and cancer. Remarkably little is known about when and where their movements occur in developing reproductive cells, the key process that ensures their propagation in future generations, but can lead to genetic disorders for the hosts. To address this problem, a team of Carnegie researchers developed new techniques to track the mobilization of jumping genes. They found that during a particular period of egg development, a group of jumping-genes called retrotransposons hijacks special cells called nurse cells that nurture the developing eggs. 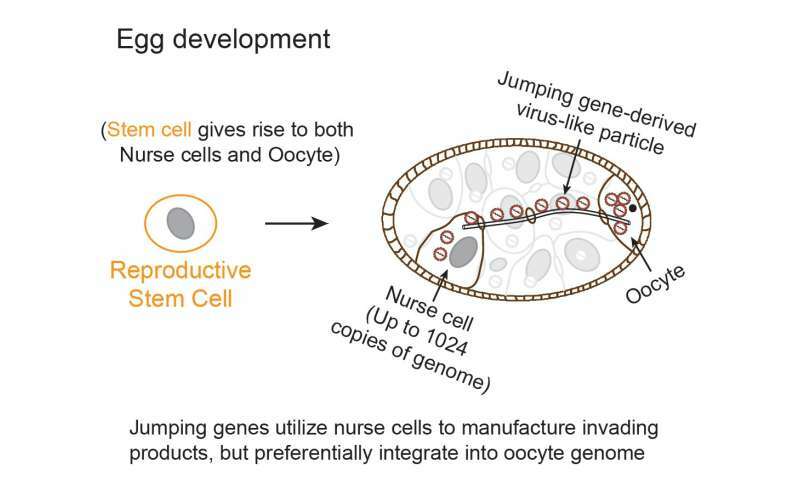 These jumping genes use nurse cells to produce invasive material (copies of themselves called virus-like particles) that move into a nearby egg and then mobilize into the egg's DNA. The research is published in the July 26 on-line issue of Cell. So many od questions. In the lab we can certainly do some of those cell conversions. Age statistics is on the internet, feel free to search. Science is mainly to satisfy curiosity and/or give technology. Environmental protection engages, but ecosystems are rarely balanced over time.